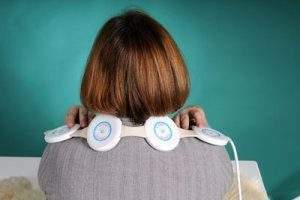 The Almag-01 – unique PEMF device acts on the damaged organs by the Travelling Pulsed Electromagnetic Field (tPEMF) and contributes to the disappearance of pain, relieve symptoms of inflammation, the return of efficiency, reduces the amount of drugs. tPEMF due to the effect and distribution of the magnetic field for several emitters in the area of impact at the same time has the entire spine, or a substantial part of the internal organs, or a large surface area of the body or limb patient a joint or adjacent two joints. Osteochondrosis with radicular syndrome reflex; cervical osteoid of the pain in the joints, to restore their mobilitychondrosis; deforming osteoarthrosis; arthritis and arthritis of various joints; bursitis. damage to the musculoskeletal system and their consequences: fractures; internal injuries of the joints; host-traumatic contracture of the joints; wounds; soft tissue injuries; hematoma;almag01_41 damaged ligaments and muscles; post-traumatic edema; weak healing sores; cellulites; burns; keloid scars. cardiovascular system: hypertension I-II degree; obliterate atherosclerosis of lower extremities (obliterate endarteritis). gastro-intestinal tract: pancreatitis in subacute and chronic stages of disease; biliary dyskinesia; chronic gastritis; peptic ulcer and 12 duodenal ulcer. diseases of female genital mutilation: inflammatory diseases of the uterus and adnexa during stihaniya acute process; diseases caused by hypofunction of ovaries; complications after operative delivery (caesarean section). diseases of the venous system of upper and lower extremities: deep vein thrombosis of leg; ileofemoralny thrombosis of the lower limbs, acute and chronic, chronic thrombophlebitis in a stage of trophic disorders; thrombosis of the subclavian vein; state after phlebectomy. complications of diabetes: diabetic angiopathy; diabetic polyneuropathy. dermatological diseases: pruritic dermatoses; state after skin plastic surgery; chronic nonspecific lung disease: chronic bronchitis; chronic pneumonia; bronchial asthma. neurological diseases: peripheral nervous system diseases; disease of the brain (when combined transient ischemic with chronic coronary heart disease). Contraindications of ALMAG device – common to physical therapy devices, including inflammatory diseases in the acute period, bleeding and bent over him; hypotonia; purulent processes to surgical treatment, severity of coronary heart disease, early postinfarction period, the acute phase of cerebrovascular accidents; pregnancy, systemic diseases of blood cancer, hyperthyroidism, diencephalic syndrome, plus the existence of an implantable pacemaker in the treatment area. The presence of metallic inclusions in the bone tissue is not a contraindication. The device Almag-01 is equipped with detailed instructions, in which this method of application, indications and contraindications. Application does not require special medical education. The service life of the instrument Almag-01 ranges from five to eight years. ALMAG 01 AND ITS ADVANTAGES. It is no secret that today the majority of people engaged in mental work have more health problems than those who engaged in heavy physical work. Currently, the negative impact of a computer and a sedentary lifestyle is known to all, but how to deal with it, few know. Using the instrument Almag-01 will help prevent diseases such as: * Osteochondrosis by long stay in one position; * Reduced visual acuity; * Headaches due to cerebrovascular accidents; * Neurasthenia, depressive states; * Flaccidity of muscles; * Constipation, flatulence, hemorrhoids; * Prostate diseases due to stagnant conditions. Unique technology tPEMF (Travelling Pulsed Electromagnetic Field) has no analogue in the class of such devices. Generated by the controller controlling impulses alternately include magnetic transducers with frequency, the most relevant biological frequencies of your body. Transmitted from one element to the magnetic field as it moves, “runs” along the location of sources, the body and organs of the patient, which leads to the enhancement of its bioactive properties. The dynamics of the magnetic field is such that during the procedure, there is no adaptation of the body and reduce the beneficial effects of the magnetic field. Official medical science has long used similar devices in the treatment of injuries, fractures, postoperative states. However, most of the earlier devices had a significant size, making them difficult to use outside medical institutions. Almag preserves the dignity inherent in a classical magnetic therapy devices, increasing their use of the latest developments, is available for medical offices, and for self use at home, as evidenced by numerous reviews of grateful patients. THE MECHANISM OF ACTION OF A MAGNETIC FIELD Analgesic effect is achieved due to the blockade of nerve impulses, which reduces the spasm of tight muscles, improve blood circulation in the place of impact due to increase in the lumen of the capillary bed, which causes: a) antiedematous effect and create favorable conditions for the outflow of fluid, and b) recovery of acid-base balance in by leaching of products of inflammation in the affected area, and c) saturation of tissues with oxygen and nutrients needed to restore altered tissue. The fight against degenerative processes: stimulation of tissue respiration (activation of metabolism of carbohydrates and lipids – an increase in unesterified fatty acids and phospholipids in the blood and internal organs, a decrease of cholesterol in the blood). Effect of the magnetic field Almag-01 leads to blockade of nerve impulses, which leads to the removal of muscle spasms. Improves circulation and blood flow by increasing the lumen of capillary vessels, there is a significant antiedematous effect. Products of inflammation leave the affected area, fabric saturated with oxygen and trace elements, which leads to a normalization of the state organs. Are stimulated and restoration of tissue respiration, metabolism of carbohydrates, lipids occur more actively. This leads to an increase in interest in the tissues of polyunsaturated fatty acids that are of particular importance for improving the immune resistance of the organism. HOW ALMAG-01 AFFECTS THE HUMAN BODY? The most effective factor for the force effect of the magnetic field of the device ALMAG is the interaction with charged particles, which leads to increased intracellular and intercellular exchange. The magnetic field increases the interaction between the chemical elements involved in redox processes, which improves the metabolism in tissues and cells of the human body, greatly enlivens the ionization process, which is very important (! ), Because ionic state of matter is most active. Compared with constant and variable sinusoidal Travelling pulsed electromagnetic field (TPEMF) has the highest biological activity, as has the maximum number of parameters that provides maximum spatial and temporal heterogeneity of this type of field. That is the tPEMF, is a complex heterogeneous across time and space field that generates magnetotherapy device ALMAG -01. Alternate sources include the four PEMF the instrument ALMAG -01 creates the effect of moving the magnetic field in space, magnetizes greater than in existing devices, part of the patient’s body eliminates the possibility of mutual influence of sources and distortion of the magnetic field lines. Application tPEMF excludes adaptation to the impacts due to the fact that adaptive control systems do not have time to respond to the continuous “displacement” of the source effects and phase changes. 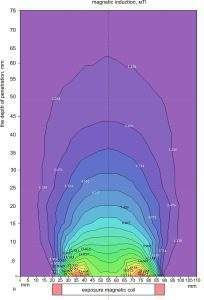 According to studies, and charting the depth of penetration of the electromagnetic field in the patient’s body instrument ALMAG significantly more than existing devices, and is 6-8 cm, which is able to directly influence them to different internal organs. Used in the ALMAG-01 device repetition frequency electromagnetic pulses falls within the range of biologically active frequencies of 4-16 Hz, open-American biologist Adey (William Ross Adey, “Cooperative mechanisms of cerebral tissue susceptibility to external and internal fields.” Human Physiology) and is a biological frequency, which has a rhythm that is close to normal frequency of various biological organism. Overlap in these cases, strictly rhythmic magnetic field contributes to the normalization of condition of exposed organs and tissues. Thus, the device ALMAG is a new and effective means of helping with many common diseases. The device is recognized by European supervisory institutions, the most effective and versatile device to aid in the treatment of many diseases. The device is especially indicated for people suffering from chronic illnesses to severe, complete treatment which other methods were possible only in hospitals. ALMAG easily makes short work of acute illness and return to normal life. This is confirmed by numerous protocols of medical tests conducted in leading hospitals in Russia, CIS, Europe, Israel and Australia. All developing beneficial changes in organs and systems lead to a gradual improvement in the overall condition of the body, reach a maximum by the end of treatment, and long have been sustained after a course of treatment conducted. This allows the patient to continue to pursue short courses of prophylactic and not to think about issues related to health. A striking example of this is the scarring of chronic ulcers of the stomach and duodenum ALMAG-01 after two courses of treatment by ALMAG. Later the attained effect confirmed the spring-autumn prevention course, while the therapy carried out earlier drugs, gave only temporary improvement. In diseases of the musculoskeletal system allows the use of the device ALMAG-01 without resorting to drugs and not spending money on expensive resorts, get rid of the pain in the joints, to restore their mobility. This in turn enables us to return to active lifestyles, improve the general condition of all organs of the body, and restore your metabolism. In 1979 the FDA approved non-invasive devices using pulsed electromagnetic fields designed to stimulate bone growth. In 1991, PEMF Therapy was approved in the US for adjunctive use in the palliative treatment of postoperative pain and edema in superficial soft tissue. In 2004, pulsed electromagnetic field system was approved by FDA as an adjunct to cervical fusion surgery in patients at high risk for non-fusion. The use of tPEMF stimulation has been found to be safe. It has also been proven safe and effective in treatment of delayed union in long bone fractures and patients at a risk of non-union following spinal fusion surgeries. Magnetic and electromagnetic fields are now recognized by the 21st century medicine as real physical entities that promise the healing of various health problems. Long-term clinical trials in leading clinics of Russia, Europe, China, India, Israel and Australia show excellent results. Side effects were not identified. Disclaimer: This information is not intended to replace health care advice of a physician. No statements made herein are intended to diagnose or treat human illness. If you have pain, fatigue, discomfort or any disease, please see your doctor. Though pulsed electromagnetic field therapy devices have been evaluated and given 510(k) clearance by FDA, the Almag 01 has not been evaluated by this organization. Almag 01 listed with FDA as a biofeedback device. ALMAG-01 made in Russia expressly for use just in Power Grid of USA/Canada (120 V/60 Hz).